In a wide column, you wish to insert a section with multiple columns. This article only applies to Senior District Webmaster who have advanced webmaster rights. For example, add a two-column section below the title in the sample below. Select the module directly above or below where you wish to insert the new layout, then click the appropriate arrow icon on the toolbar (as pictured above). When the Insert module window pops up, select the Layout tab, then choose the 100% row module. Hover over the newly added row to reveal the plus sign for adding a module inside the row. 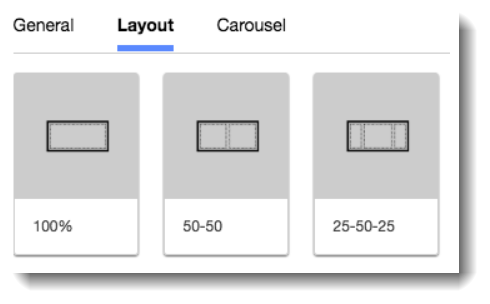 This time, choose the layout module with the desired number of columns (e.g. 50-50). You now can add modules as you would normally. For illustration purposes, we're showing additional text modules. In some cases, you may need to add padding around the modules in your newly added columns. To add padding, select the module, then use the Layer menu to choose the column above the module. Once the column is selected, check the box on the toolbar to Add Padding. Make sure to Save your work when you are done formatting the layout.